January 10, 2019 November 26, 2018 by Robert Ortiz-Abreu, Jr.
1. Too many AGCRA award recommendations are submitted on non-members or people who started a membership application but didn’t complete it. Individuals submitting awards should ensure that the nominee’s Association membership is current. You can check the nominee’s membership by e-mailing Membership@agcra.com or Awards@agcra.com. Awards are delayed when there are membership issues that need to be resolved prior to the award presentation date. 2. 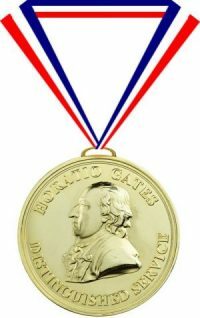 The Horatio Gates Bronze Medal requires significant contributions to AGCRA over an extended period of time. The Gates Gold requires extraordinary contributions over an extended period of time. When AGCRA contributions (e.g., serving as a Chapter Officer, lead / organizer for Chapter or Association events (examples – AG Ball, Breakfast, Luncheon)) is not mentioned in a Gates Medal recommendation, the award will not be approved by the National Executive Council (NEC). 3. Award timeline submission – the earlier the award is submitted, the easier it is and less expensive it is to process. Once received, processing the award, reviewing to ensure it meets all criteria, verifying membership, and getting it voted by the NEC takes time. Approved awards with medals and certificates are not shipped until payment is received. 4. When all requirements are met, the award certificate is prepared, and the medal is assembled and packaged for mailing. First Class and Priority postage is included in the cost of the award. If expedited postage is needed because of a late submission, the recommender submitting the award pays for the additional postage. 5. Every March through July is our awards busy season. Please submit early! POC for the AGCRA Awards Program can be reached at Awards@agcra.com.